Meditation is a hot topic in the Western world. Despite existing for thousands of years, it is experiencing a resurgence in popularity. Today an estimated 18 million people have some form of regular meditative practice, and it has become ubiquitous with the world’s top performers. In this post I will delve into the background and practice of my personal meditation method. The idea behind meditation is simple. Through various methods, you find a way to quiet your mind and turn off outside distractions. However, humans took this very simple concept and did what they do best; stigmatize, commoditize, and commercialize it. The most popular method of meditation is transcendental meditation (TM) which costs thousands of dollars and includes confusing secular guru worshipping. In this method you are given a mantra which you repeat over and over again in your head while meditating. Some people think this is worth $2,000-$3,000, but I believe this to be a colossal waste of money. Other popular methods focus on awareness of your breathing. A popular form of Buddhist meditation, called Anapanasati, consists of intensely focusing your thoughts on the push and pull of the inhale/exhale rhythm of your breathing. I tried these forms of meditation. I routinely failed. My hyperactive internal dialogue screamed at me the entire time to get up and get work done. I quickly lost focus then lost interest. However, I regularly revisited the idea of meditation, each time making small tweaks to the technique. Eventually I developed a new form of meditation that I now practice every day. It costs $0, requires only that you have a brain, and you can start tomorrow. I want to talk specifically about the “mantra creation” in this meditation method. After you do this a couple times, you’ll find that your mind is actually really good at telling you exactly what you currently need to hear. This is your brain tapping into your subconscious and bringing to the forefront whatever currently needs attention. Sometimes these are corrections for minor insecurities, sometimes they are broad lifestyle corrections, and sometimes they get pretty heavy and meaningful. An example of one of the lighter insecurity-correcting mantras is the one I used today: “reset.” I had subconsciously noticed some bad habits forming over the past few days, and when I sat down to meditate, my mind was telling itself to get back on track and find proper balance in life. This is the mantra I have used for the past 3 days, and I have clearly noticed results. Occasionally your mantra will seem unrelated to your current problems, or it will seem silly and meaningless. It won’t always be perfect, and that is perfectly fine. Often times, although it may seem meaningless, there is actually a deep-seeded reason your subconscious brought that word to the forefront of your mind. Trust your brain, and acknowledge that you are going to screw up from time to time and no harm will be done in doing so. Another awesome byproduct of this meditation is while you are meditating you are creating an association between your breath and your chosen mantra. As the day goes on and you continue breathing (hopefully), whether you are aware of it or not, your brain is recalling your mantra constantly with each breath you take (thanks, Science). Not only are you reaping the usual benefits associated with meditation in this practice, but you are also priming your mind for whatever you most need on that given day. Adopting a meditative practice was one of the most important changes I have ever made to my life. A few years ago I was dealing with anxiety and early forms of being manic-depressive. I was lucky enough to catch this early on and take proactive steps toward correcting it. Only one chemical imbalance (Vitamin D deficiency) was to blame, and the rest was mental. 17th Century French philosopher Blaise Pascal said, “all of humanity’s problems stem from man’s inability to sit quietly in a room alone.” This was a massive problem in my life, with distractions constantly occupying prime real estate in my mind. The most harrowing moments of anxiety occurred late at night when I felt completely isolated and alone. I wasn’t comfortable by myself, and my brain would run rampant in my skull inducing horrible panic attacks. If you’ve never been in the middle of a panic attack at 3:00 AM, feeling paralyzed in your bed with your heart and mind racing, consider yourself lucky. It’s terrifying. And as the attacks increased in frequency, I was smart enough to see my doctor about this problem. I was told to give it another 2 months and if it continues to get worse, I would come see my doctor again to get a prescription for antidepressants. During that two month period, I had a strange moment of clarity in which I realized wholeheartedly that I simply did not want to feel this way anymore, and I absolutely did not want to be reliant on artificial drug-induced happiness. Manufactured happiness that is dependant on exogenous substances could not be as fulfilling as the real thing. In my mind it was the equivalent of people driving to the top of Mt. Washington. Without the hardship and struggle of climbing the mountain by foot, the view from the top is far less rewarding. Shortly thereafter I learned about the benefits of meditation and started practicing various forms (initially TM). Along with meditation I began to put a serious emphasis on training and nutrition, and by the time my appointment rolled around 2 months later, I was happier, healthier, and had a completely different outlook on life. That was after only two months of meditating with a method that is less effective for myself than the one outlined in this post. Now, after 3 years, I am still reaping enormous benefits in my day to day life from meditation, have conquered various phobias that caused anxiety (such as a deathly fear of flying and claustrophobia), haven’t had a single panic attack in over 2 years, and go through each day happier than the last. I hope everyone takes at least one actionable step towards improving their life from this post. I strongly recommend sitting down tomorrow morning in a quiet place and giving yourself 5 minutes of silent meditation. I promise if you stick with it the benefits will be astronomical. 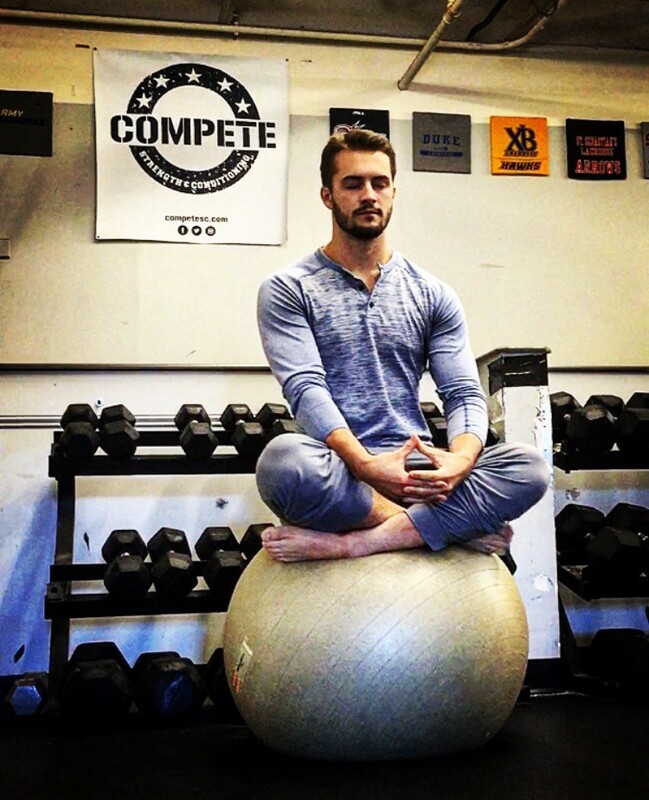 If anyone has any questions about any information in this blog, or just wants to comment on how handsome I look on top of a swiss ball, send an email to DeanAdams@CompeteSC.com. Providing the information to make you a top competitor in all aspects of life. Nutrition, training, and lifestyle performance.